Application example of crystallizer - Salt-separation from ammonium sulfate bath | KATSURAGI INDUSTORY CO.,LTD.- Dryers,Drum Flakers,Concentrators,Crystllizers. 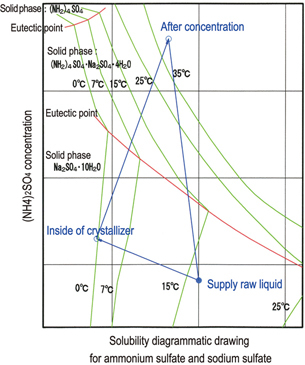 Crystallization is performed not only to produce solid body products, but also, as a main purpose, to recover a solution (recover crystals at the same time) by separating impurities dissolved in the solution. Concentrated crystal separation for volume reduction of wastewater is also included in this category, although no solution is recovered. In this way, even if crystal products are not the purpose, it is needless to say that design in consideration of basics of crystallization is important. As long as the solubility diagrammatic drawing for three components (ammonium sulfate, sodium sulfate, and water) is seen, the solid phase (stable crystal system) in the low temperature area below 30°C includes aqueous sodium sulfate, ammonium sulfate, and double salts of sodium sulfate and ammonium sulfate. This example is intended for crystallization in the area where aqueous sodium sulfate is extracted. 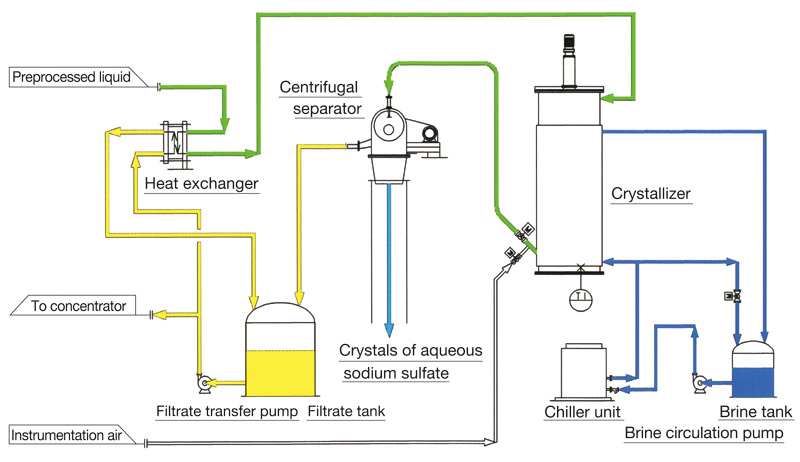 Thus, as a possible process, aqueous sodium sulfate is initially separated as crystals by cooling crystallization, and then a separated filtrate is concentrated, as shown by the operation line on the right figure. 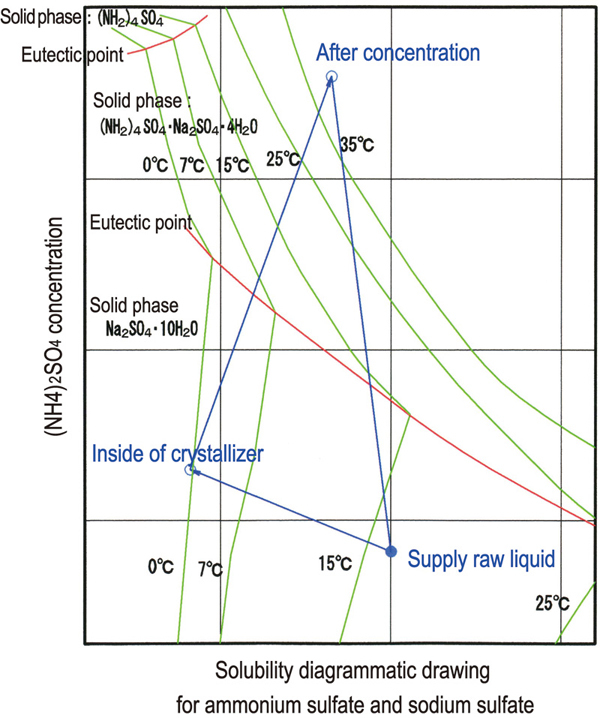 The outline flow sheet for the crystallization process in this example is shown below. The supply raw liquid whose ammonium sulfate concentration has become low and sodium sulfate concentration has become high is pre-cooled by a separated filtrate, and then sent to the scraping-cooling crystallizer installed outside, cooled up to the specified temperature by brine, and then sent to the continuous type centrifugal separator. Liquid is sent to the separator by air lift. The separated filtrate is sent to the concentrator after heat exchange with the raw liquid, concentrated up to the specified ammonium sulfate concentration, and then recovered. The separated crystals contain little ammonium sulfate and they can be recovered. However, as the volume is small, they are dissolved and sent to the wastewater treatment system. 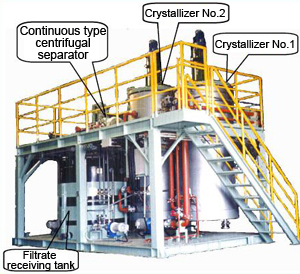 The photo on the right shows the system delivered using a skid method with a continuous type centrifugal separator, filtrate tank, dissolution tank, and pumps incorporated in the dual-tank in-line crystallization process. The tank dimension and quantity are determined in consideration of land transportation using a skid method. These facilities which are not directly used as production facilities require low-priced facility and running costs as well as 24-hour operation without humans in attendance. From such standpoint, please consult Katsuragi Industry with lots of experiences about the crystallization process.